Ravens (Corvus corax) are becoming more common in Pittsburgh but you might not notice them because they resemble crows (Corvus brachyrhynchos). In the past month I’ve looked closely at pairs and solo crows. Sometimes I discover they’re ravens. Here are tips for telling them apart, listed from easiest to hardest. Tail shape: In flight ravens have wedge-shaped tails, crows have straight-across or curved-tip tails. Sound: The raven’s call is a rough “Brock! Brock!” Crows say “Caw! Caw!” Ravens also say a lot of bizarre things. Flight style: Ravens soar and sometimes tumble, crows flap. If you see a soaring corvid it’s a raven. Size (not always helpful): Ravens are larger, the size of a red-tailed hawk. Silhouette: Because the raven’s tail is longer and wider, his head looks relatively small and pointy. Beak: Ravens have big powerful beaks, crows do not. These silhouettes illustrate two field marks. On the left, two crows have straight-across or curved tips on their tails. On the right, the solo raven has a wedge-shaped tail and his head looks relatively small and pointy. Sound is the best field mark if the birds are calling. This audio clip from Xeno Canto has a raven in the foreground (Brock! Brock!) and crows cawing in the background. Ravens also have an amazing vocal repertoire including these unusual sounds: The Bell call, a machine sound, a water drop, “taco taco” and much more. Still stumped on how to tell the difference? Here are additional tips and a quiz from The Raven Diaries. p.s. Click here for an audio treat that includes ravens calling in almost-human voices, recorded in the Adirondacks near Vermontville, NY. 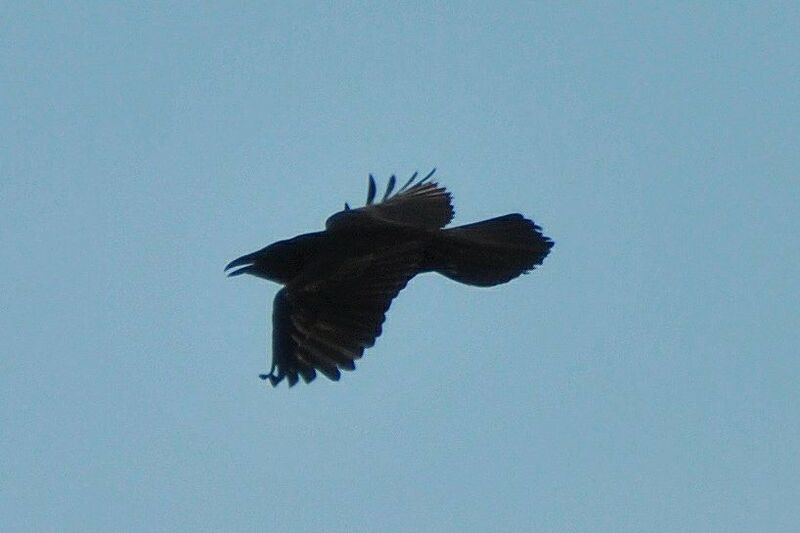 Timely post: I saw what I believe was a raven chasing a red-tailed hawk over the Southpointe industrial park yesterday. Sounded like a raven, but didn’t have the obvious diamond tail shape, but did soar with the hawk, but was smaller than the hawk. And was single. Two crows in the parking lot cawed a bit, but declined to join the fight. I’m pretty sure it was a raven I saw, which would be unusual for the area. They seem to be more commonly seen outside of the mountains lately, though. Calling it a raven. Thanks Kate, I really enjoyed this post today! I learned a lot. Also, I love the audio clips you embed, they are super helpful. The video was perfect.